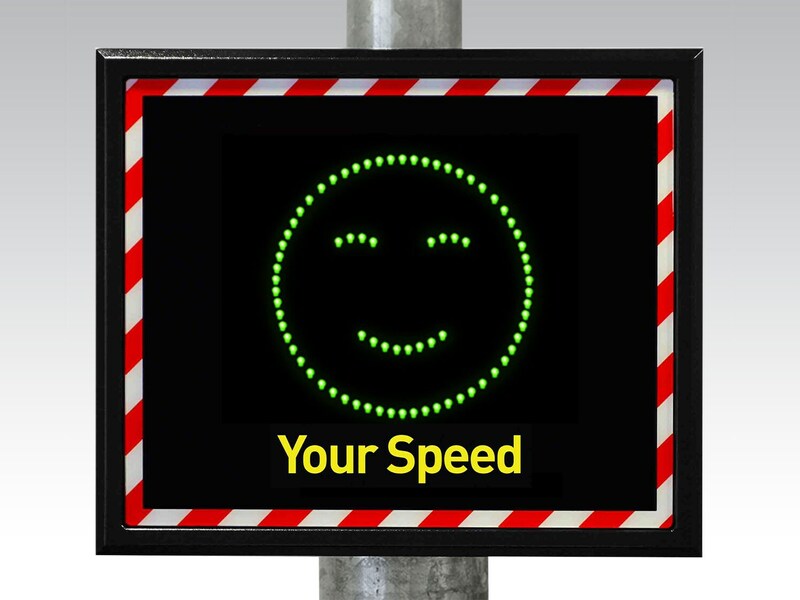 The TEMPODIS 230 M speed display sign gives road users a clear indication of their speed. This increases road traffic safety. The TEMPODIS 230 M speed display helps to make speed visible on the powerful LED Display. This has the effect of traffic calming outside schools, kindergartens, hospitals or on your company premises. A radar sensor records the speed of approaching vehicles. Drivers can immediately see whether they need to slow down. A smiley face or sad face emphasizes this information graphically. The speed display can be seen clearly from a distance up to 150 meters. The LEDs adjust their brightness automatically according to ambient light conditions, from sunshine to late into the night. The TEMPODIS series speed displays store data of up to 40 million vehicles. These include speed, direction of travel, date and time. You can analyze this information on your computer using Jenoptik TEMPOVIEW software. The robust TEMPODIS housing is weather-resistant, extremely stable and provides protection against damage and vandalism. The speed display is powered via a 230-volt connection power adapter, a battery with charger or a solar panel. Accurate: The radar sensor records speeds quickly and reliably. Positive and negative feedback: The smiley face and sad face show drivers instantly whether they are going too fast. Automatic brightness: The LEDs adjust automatically to night or bright sunshine. Robust: Weatherproof housing, protected display and anti-theft bracket. Urban centers: For example, outside schools, kindergartens or hospitals. On your company premises: Wherever you want to improve traffic safety on your company grounds.